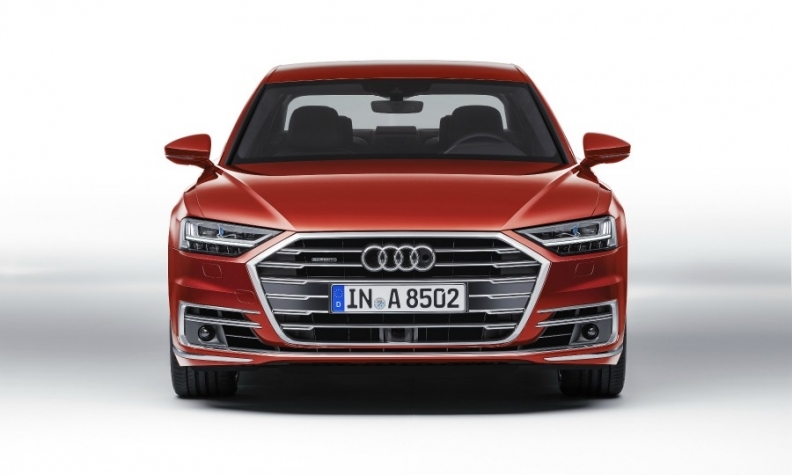 A successful launch of the new A8 would help allay concerns about CEO Rupert Stadler's ability to turn around the brand. Audi CEO Rupert Stadler, under fire for the luxury automaker's role in parent Volkswagen Group's emissions-cheating scandal, is counting on the new-generation A8 and other new models to appease his critics. Unveiling the latest version of the flagship sedan in Barcelona Tuesday -- surrounded by spinning cars and flashing lights -- the CEO only hinted briefly at his mounting troubles as he described the new A8's self-driving prowess and Audi's upcoming lineup of SUVs and electric vehicles. "Audi in Latin means listen," said Stadler, who's taken a lot of heat from fellow executives and labor leaders in the past year amid declining sales and widening legal probes into Audi's role in the diesel engine manipulations. "'We listen when we get applauded and we listen when we get criticized." Stadler, who took over at the luxury brand a decade ago, faces his toughest test yet as VW Group's major profit contributor struggles to get out of a funk that's tarnished its premium reputation and left it trailing competitors Mercedes-Benz and BMW. A successful launch of the new A8 would help allay concerns about the CEO's ability to turn around the brand and quash complaints about Audi's static designs and outdated portfolio. There's a lot at stake, since VW Group can't afford Audi to falter. Profits from the Ingolstadt-based manufacturer are vital to stem an unprecedented financial hit from the emissions crisis that cost VW Group more than 22 billion euros ($25 billion) so far, with numerous investigations and lawsuits still pending. There's a lot at stake for Stadler personally, too, after Audi widened its recall of diesel cars in Europe only weeks after his contract as CEO was extended by another five years in May. The recall affects some 24,000 A8s and A7 four-door coupes built between 2010 and 2013, the top models for the marque, raising fresh concerns about the reliability of Audi's emissions claims. The finding triggered a clash between Stadler and German Transport Minister Alexander Dobrindt, which earned the Audi CEO harsh criticism from his own company ranks. In a sign of support, VW Group CEO Matthias Mueller attended Tuesday's event, as did and Hans Michel Piech, a key member of Porsche and Piech clan that owns VW Group. A spokesman for Mueller reiterated the VW Group CEO continues to back Stadler. The updated A8 --the first vehicle styled from scratch by new Audi design chief Marc Lichte -- features voice controls and an electrified powertrain, and can drive autonomously in slow-moving traffic. Appearing in the latest Spider-Man blockbuster, the car has sharper lines all around to make it more muscular, and a wider front grille. The revamp is part of Audi's strategy through 2025 to focus on adding all-electric cars to its lineup, boosting digital services and adding autonomous driving options. The manufacturer is gearing up to roll out key models including its first full-size Q8 SUV and the first all-electric vehicle dubbed e-tron in the coming years, cars that will determine whether Audi can regain lost sales ground to Mercedes and BMW. "It's an important car that could help them move forward in the current situation" said Tim Urquhart, a London-based analyst at IHS Markit, "especially since the last iteration of the A8 was a little disappointing."